With hundreds of video productions under our belt, we can count on one hand the number of times we’ve worked with a dedicated audio person. Back in the ‘good old days’ of larger budgets and crews, we were in diapers. That said, we’ve always felt that quality audio is as big a part as the visuals themselves in creating a truly high quality, cinematic production and is an area we are constantly trying to improve. In our documentary work, one of the things we’re most sensitive about is keeping our footprint light. If something new enters the kit, something else has to get retired to the shelf. Budgets, and as a consequence time, are always in short supply. So, we’re always looking to eliminate unitaskers - pieces of kit we can only use for one thing - especially gear that can be distracting, or even worse, intimidating to our story subjects. For the past several years we have been traveling with a K-Tek KE-79CC boom pole, which we have placed on one of the lightweight Manfrotto 5001B Nano Light Stands we carry with us for all field production with our Matthews Minigrip Head and an Auray Boom Pole Holder. 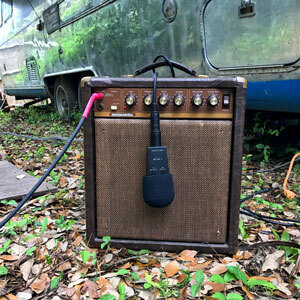 That setup is generally paired with an Audio-Technica AT4053B or Audix SCX1-HC hypercardioid microphone, which is actually a secondary audio capture to our Sennheiser MKE-2 lavalier mic. 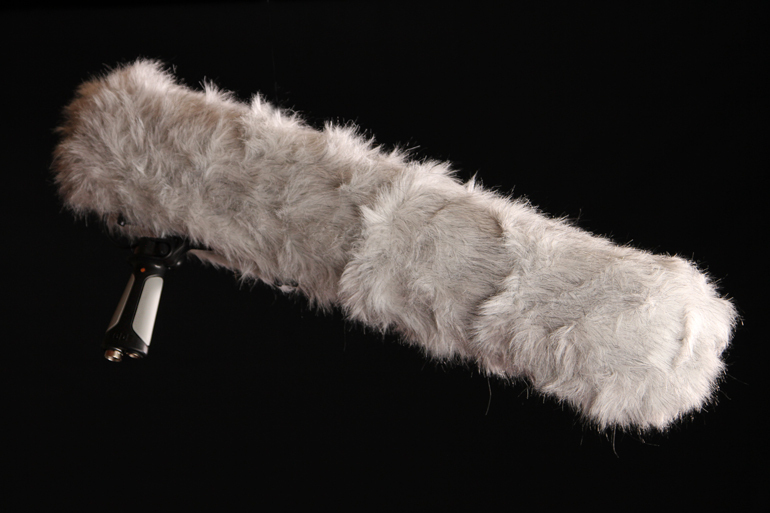 Having a strong back-up interview audio option has saved our skins more times than we can count, and so the boom pole has continued to stay in the bag on most productions. But, without a dedicated audio person, it’s always kinda been a one trick pony. So, we set out to put it to some other uses - specifically doing audio capture outdoors, maybe when the job only calls for one camera at a time, and one of the Dads can jump in as an audio guy. 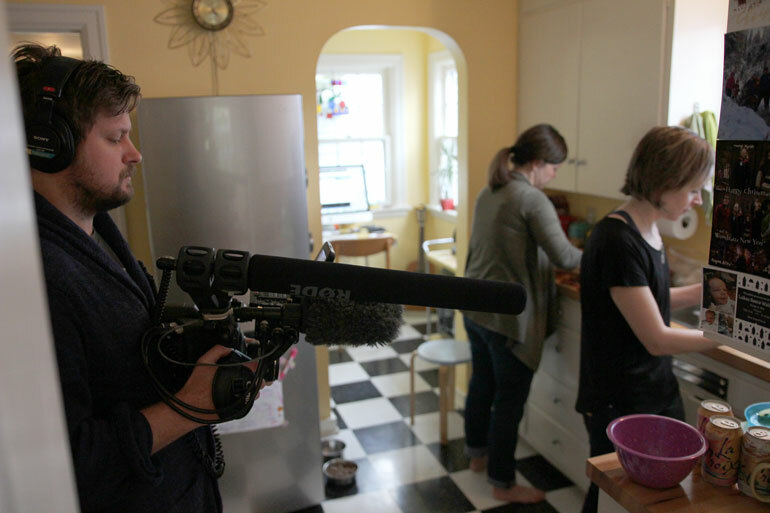 One of the main drawbacks of boom audio in a documentary production is you mostly need the mic to be pretty close. So, we set out to find an affordable long shotgun to test. Enter the Rode﻿ NTG8 long shotgun. 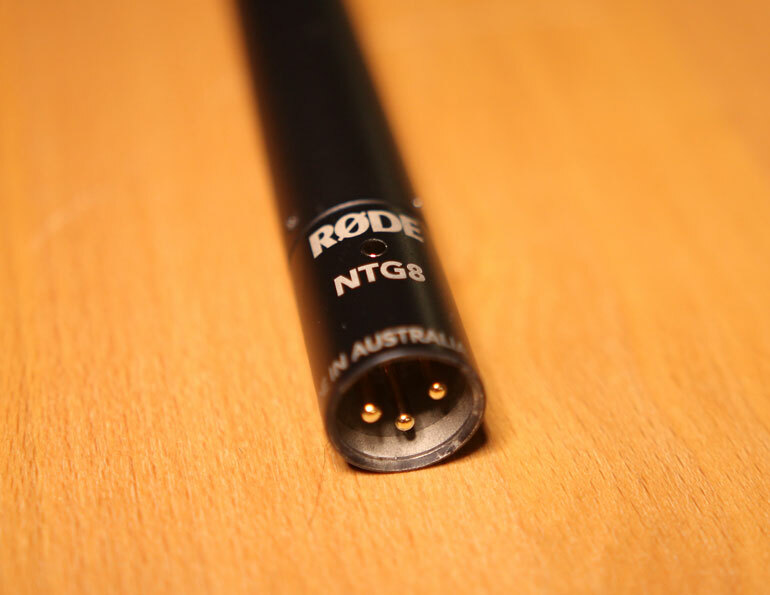 The first big selling point of the NTG8 is it is based on the popular (and certainly more commonly seen out in the wild) Rode NTG3. That’s a good solid mic that we’ve used and liked in the past. But, what makes the NTG8 stand out is its increased directionality - which basically means it can be reliably placed a bit further away from a subject than a shorter shotgun, but still get decent pick up and not be totally muddied by competing sound from the ambient environment. 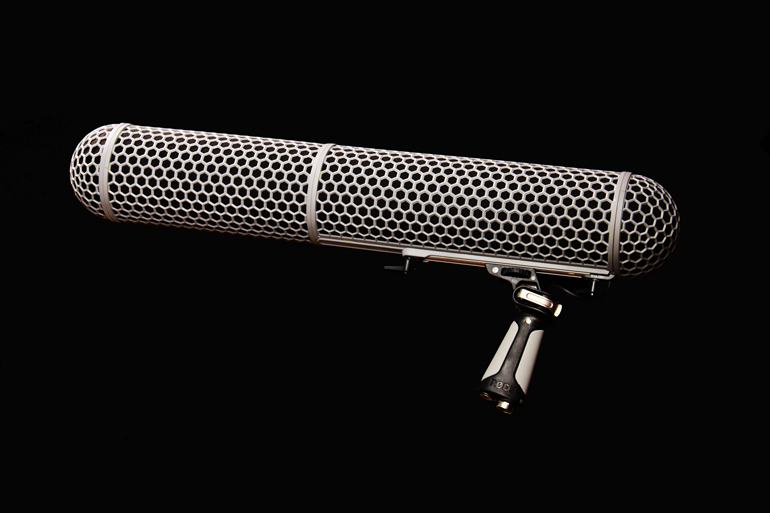 And with its supercardioid pattern, it’s more of an outdoor mic, like most shotguns but maybe on steroids. The NTG8 mic uses an RF-bias, which in practical terms means it uses radio frequency voltage. One of the consequences of that is it is better suited for use outdoors and will be less sensitive to changes in humidity or temperature in the way some microphones can be. That’s a plus for us, because we tend to work rain or shine, and don’t often have the opportunity to baby our gear. In addition, the mic comes with a pretty awesome aluminum tube you can put it in for travel. 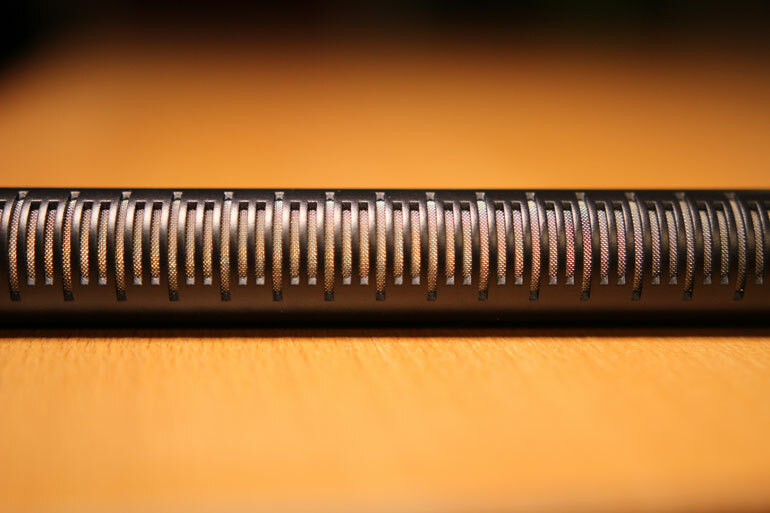 That’s a pretty nice feature, and might be an inspiration for some future DIY mic carrying tubes. 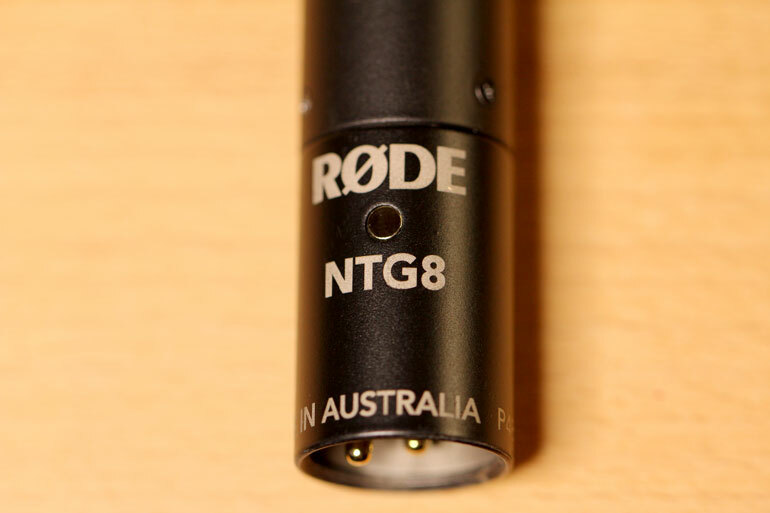 In general, Rode mics are all about being a good bang-for-your-buck option - and at $1,000 the NTG8 might seem on the high end for a lot of folks. But, when you compare it to ﻿its competitors in the broadcast quality long shotgun market, it’s actually a good deal. It also comes with a 10 year warranty, which is pretty hard to beat. That was all quite appealing to us. 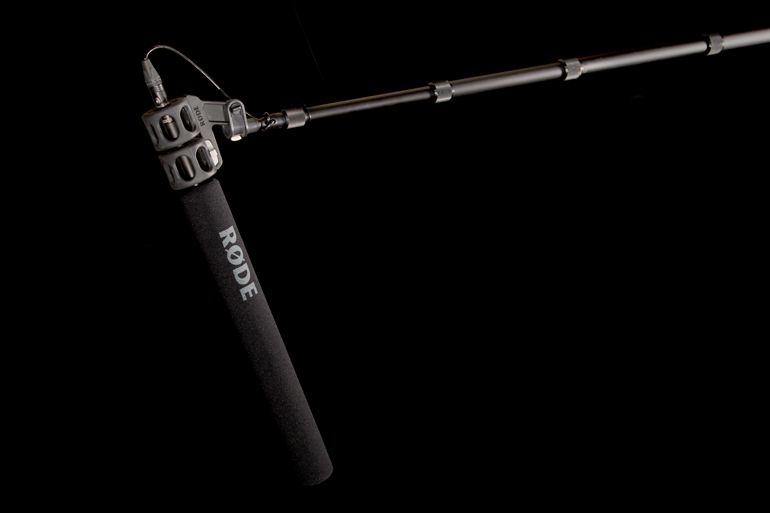 The NTG8 comes with its own, specifically designed shock mount - the Rode SM8 Shockmount - which does a great job of suspending the mic to reduce handling noise from the boom pole itself. We also used it a number of times attached to either a simple light stand or a Dinkum Systems ActionPod Pro, which is great way to clamp a mic on to a table edge, door frame or a beam in the basement ceiling. Despite the size, it was still possible to get it precisely aimed without sagging for shifting. When the mic arrived, the reality of its size really set in. At 22” in overall length (! ), the NTG8 immediately seemed too long to be practical as an on-camera mic for our Canon C300 Mark II and the kinds of work we generally do. With that reality, we did some brainstorming as to how best to integrate it into our kit and production workflow. We came up with a few rigging scenarios for a variety of shoots that make sense for the documentary or corporate videographer, whether you're one person or a small crew. We have had a Rode Blimp on the shelf for a number of years, having received it as part of some bundled promotion with other products. If you want to use it with the NTG8, you’ll need to get an optional extender, which just pops in to the center section of the unit. Keeping in mind that it’s going to be housing a 22” microphone, it’s understandably large. It becomes even moreso if you attach the removable dead cat err... dead wombat. In addition to keeping wind off the mic, the blimp has several features that reduce vibration and handling noise, including rycote shock mounts and a nicely mounted xlr connection. All those features make this and similar blimp products standard professional audio equipment on sets across the industry. To be honest, we don’t see us using this guy on many of our productions. We are sure it does a great job of mitigating wind and handling noise, but as we always say, we’re very conscious of pieces of gear that are cumbersome, make clients and documentary subjects nervous or intimidated, or just draws too much attention to itself. The blimp pretty much ticks all of those boxes, based on size alone. But, we’ll keep it in the back closet… because you never know. Knowing that we weren’t likely to bring the blimp along, and being satisfied with the SM8 shockmount, we still wanted an option for a little more wind protection than the Rode provided foam windscreen, as our primary use for the NTG8 mic is outdoor capture. What we landed on was the Gutmann Microphone Windshield, in this case originally designed for the Sennheiser MKH 816 but works well on the NTG8. An aside, the Sennheiser MKH 816 is another long shotgun, which was in simple terms the long version of the “industry standard” MKH 416, and it has been popular amongst professionals for a number of years. It has since been discontinued, but still pops up out in the world when the operator is looking for a focused range of audio pickup. 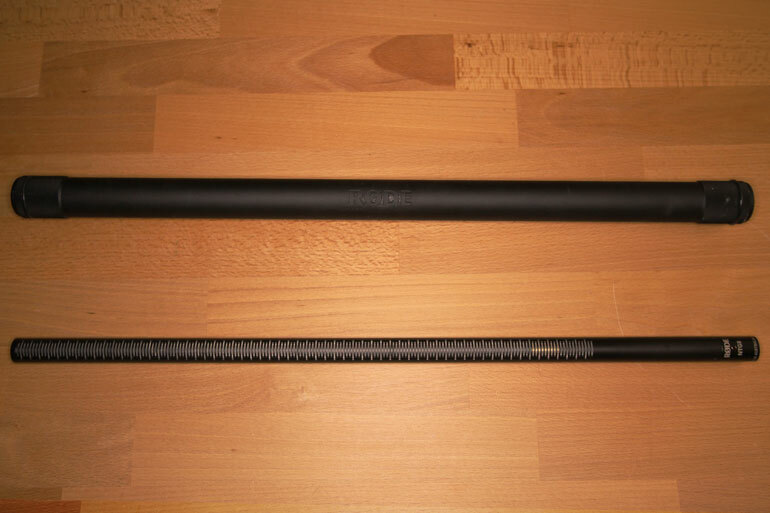 The Sennheiser MKH 8070 is their long gun currently in production. The Gutmann can be better affixed to the mic itself with a lady’s (or hipster dudes’) ponytail holder thing or a rubber band of any kind. In fact the NTG8’s provided aluminum storage tube has a couple nice rubber bands on it which could be used for exactly that. Pretty no nonsense and functional. The advantage of the Gutmann is it’s infinitely packable and portable, and being black it’s less showy and in-your-face for documentary work than a big grey blimp is. Does it provide the same level of blimp? 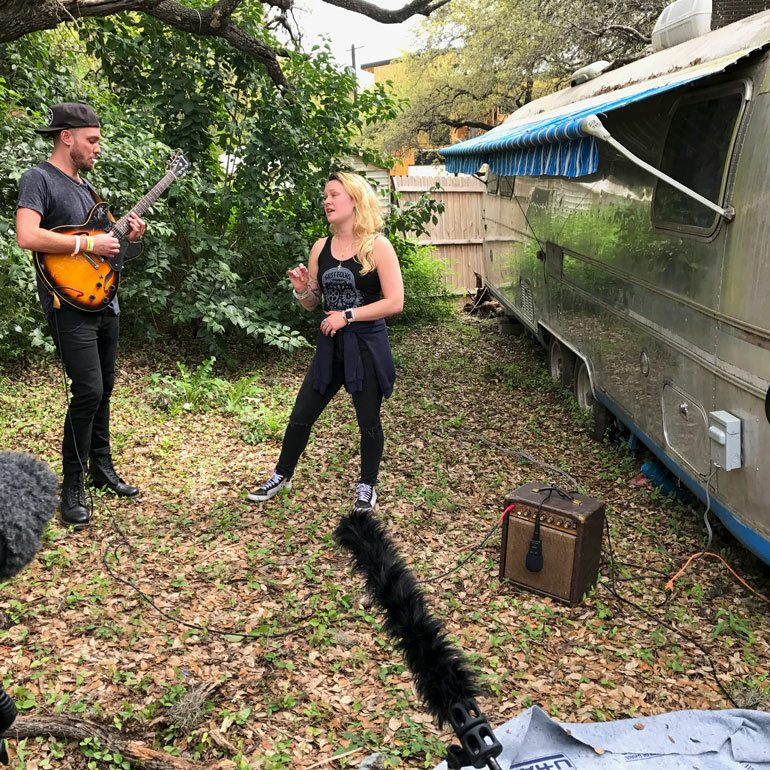 Well, probably not - but to our ears it did a good job in some pretty windy conditions during some live performance videos we shot during SXSW - more on that later. One of the pro tips we’ve picked up in the forums is in working with a long shotgun, precision operation is important. So, we wanted to try the mic on a boom pole set up that was light, simple and could be operated remotely from the camera rig without a messy umbilical type set up. To make this concept a reality, we decided to reach for Rode’s Newsshooter wireless kit. 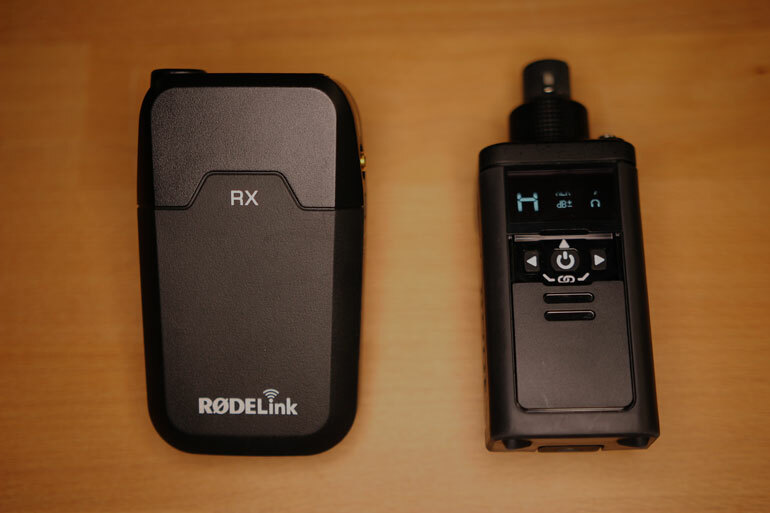 The Newsshooter can be thought of as a variant on the popular RodeLink Filmmaker Wireless Microphone System. Its design is convenient for use on handheld microphones, especially for a hosted program or a man-on-the-street style news interview. That said, it seemed like the perfect form factor to connect directly to our K﻿﻿﻿-Tek KE-79CC boom pole for a - boom - sweet wireless set up. 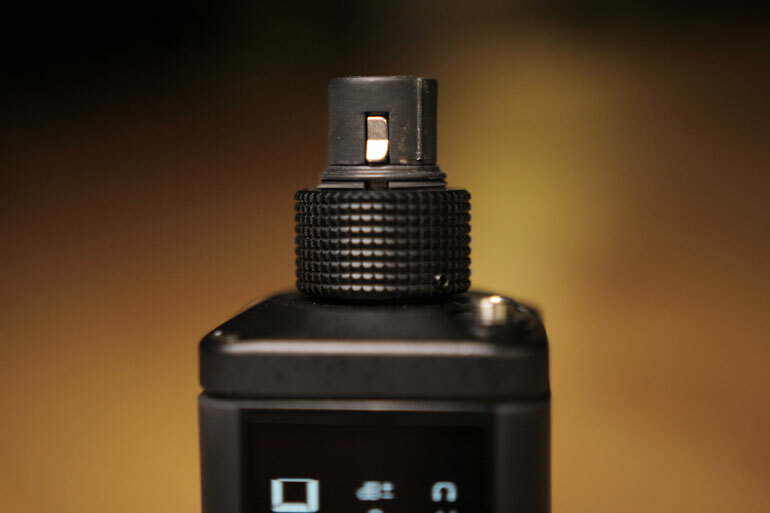 Besides the general shape of the Rode Newsshooter’s transmitter, the key to it working in this form is its nice, secure threaded connection. 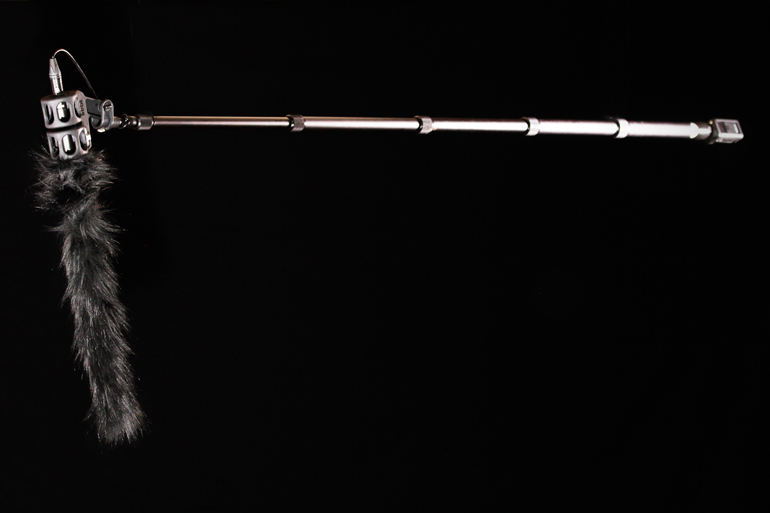 So, rather than have to try to strap a regular style wireless transmitter somewhere on the boom or the operator him/herself, this system is connected directly onto the boom pole itself, fully locked at the xlr input. In addition, another must-have feature that the Newsshooter transmitter provides is its own headphone out, so the operator can actually hear what they’re doing (imagine that). 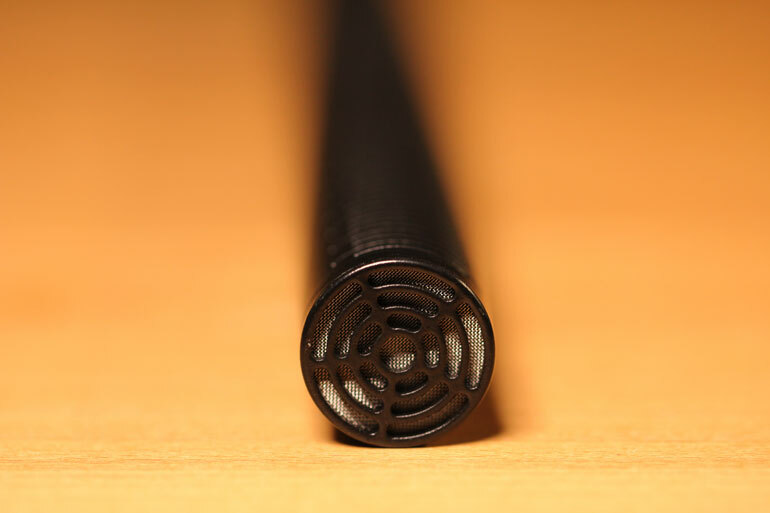 In addition to having a longer reach than some shorter shotgun mics, the NTG8 is very directional - meaning that accuracy in aiming the mic is quite important. That’s the secret to eliminating off-axis noise and other background noise, after all. So, having the ability to hear when the mic is “on” a subject is totally necessary. 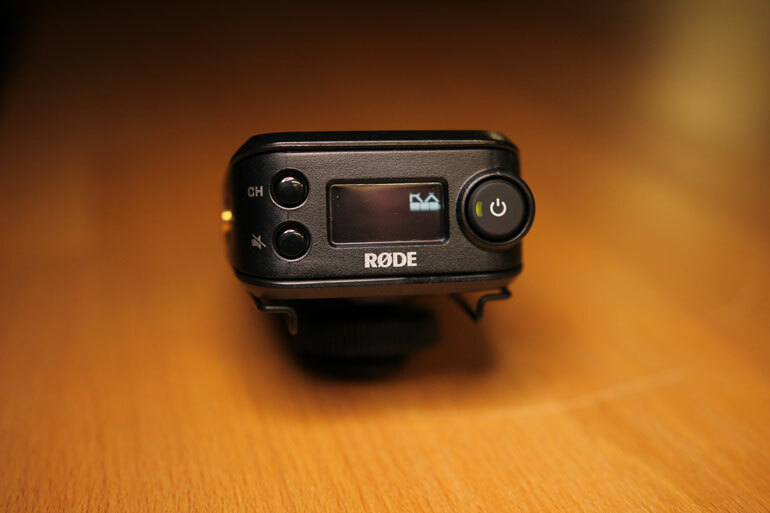 As far as other specs and functionality, the Rode Newsshooter is very similar to the RodeLink Filmmaker set, which we’ve been using for more than a year now. Both work within the 2.4GHz digital transmission range, which is where you’ll also find a lot of wifi signals. This is nice because in the past we’ve seen whole ranges of spectrum sold off by the FCC, rendering some kits “illegal” and prone to interference. That doesn’t seem likely with where the Rode kits are running. Rode has done a lot to simplify usage in both kits, which mostly eliminates the need to peruse the manual every time you want to change channels… like we’ve found ourselves doing with other professional wireless setups in the past. There are some sophisticated things about the kits - they actively monitor signals for interference and switch signals as needed seamlessly - but, that isn’t something that happens in the user's face. Simplified prosumer setups can be good, and they can also be pretty frustrating when they don’t work. In our experience, the Rode kits just work. The receivers are powered by AA batteries, and we seem to get a pretty decent full day use plus out of a charge. The Newsshooter transmitter that is actually affixed to the boom pole in this set up can be run with either AAs or a Sony NP style battery - of which many of us have tons in different sizes. With the small version of the battery, it’s a pretty tight symmetrical package. 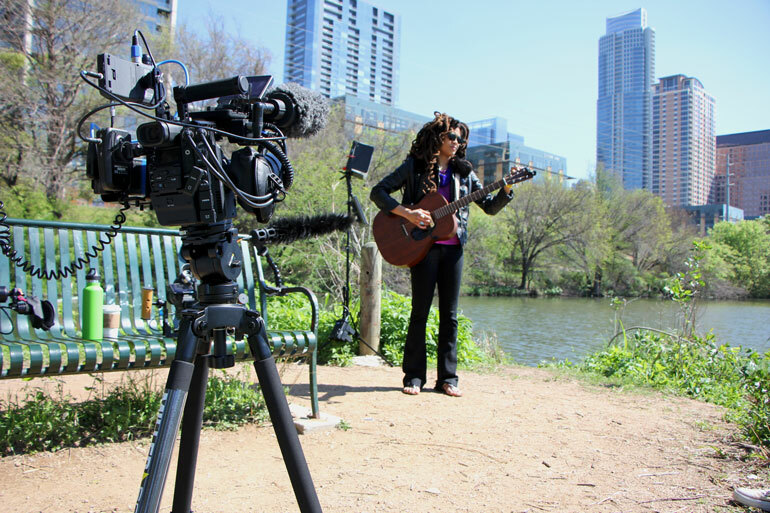 Our first shoots with the NTG8 were during SXSW in Austin, Texas - shooting live performance videos with our friends at KXT from Dallas. This was our second year doing these videos, so we had a better idea of how we wanted to shoot, which opened up some more room for experimentation - including with the NTG8. These shoots, even though they are live music, don’t have a dedicated audio person. We shoot out in public places like parks, businesses, or even right on the city sidewalks. Keeping it simple and light is a must - but, equally critical is audio quality - which means we go for variety of sources and some redundancy. 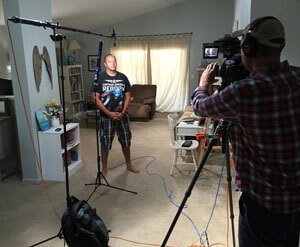 And, to add another level of challenge to the productions, we try to keep mics and stands completely out of the shot. 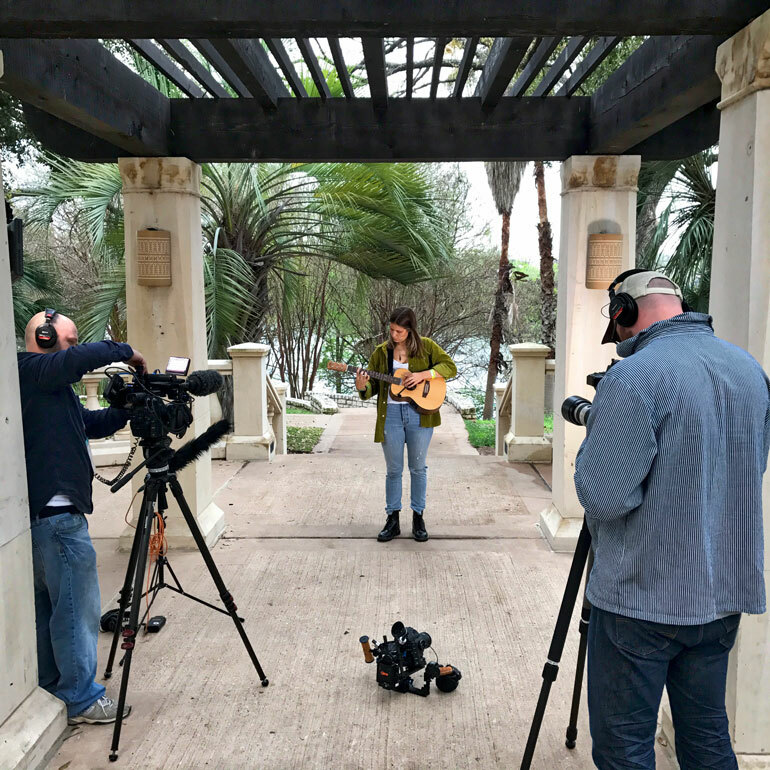 We are able to run two channels to our A cam - the Canon C300 MK II - a small instrument mic, and a Sennheiser MKE-2 lavalier in a Rode Invisilav housing, gaff taped to either the guitar strap or underneath the performers clothing to capture vocal. We had two more inputs on our B camera - a C100 Mk I - into which we could put the NTG8 and another instrument mic or something else depending on the set up. Both of those rigs were generally on sticks, like our Miller Air (which we love) with a comparatively long lens, like our Canon EF-S 70-200mm f/4 IS or even that lens plus the 1.4x Extender. For these edits we like lots of tight shots, and quite a few super tights. Our third camera, another C100, stays on the Letus Helix Jr as a ultra wide gimbal shot using the Canon EF-S 10-18mm. 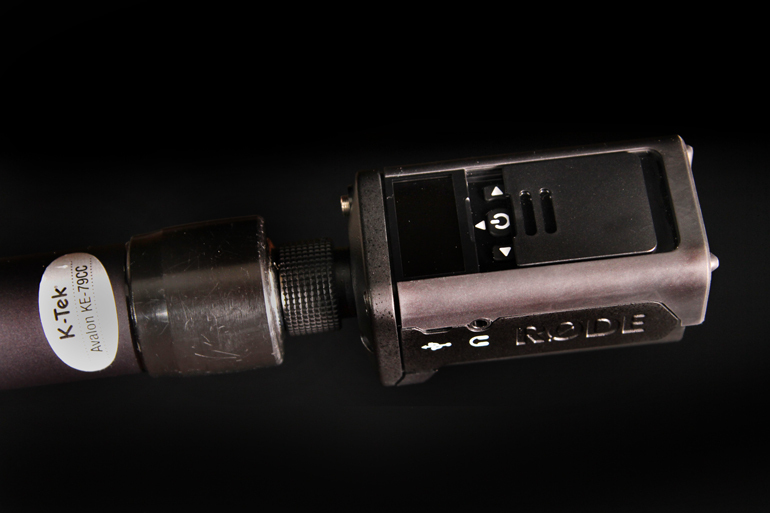 When we can, we’ll run the Rode Stereo VideoMic X on a cold shoe attachment on top of the gimbal handle. That’s another killer mic. This ultrawide angle often ends up being the master shot, and it’s always a challenge to get all the gear out of frame. For this reason, we’ve rarely used any shotgun style mics on these productions - the suggested distances from the performers just generally end up being too short. Enter the NTG8. Because we were without a dedicated boom mic operator, we opted to put the NTG8 on its SM8 directly onto a Manfrotto 5001B Nano Light Stand. This simple, lightweight set up worked well for us, and could be made even more flexible with the addition of a Cinevate Universal Accessory Mount or even a gooseneck style arm. Obviously, because of the intense directionality of the NTG8 we would have ideally had an operator using our boom pole set up - but, during our sound checks we were all impressed with the quality of sound produced by the mic, especially when placed more than several feet away. It also did an amazing job of eliminating off-axis sound, like the omnipresent city traffic we ran into at every location. The NTG8 just seems to reject all that clutter. On all the shoots, we used the Guttman windscreen. 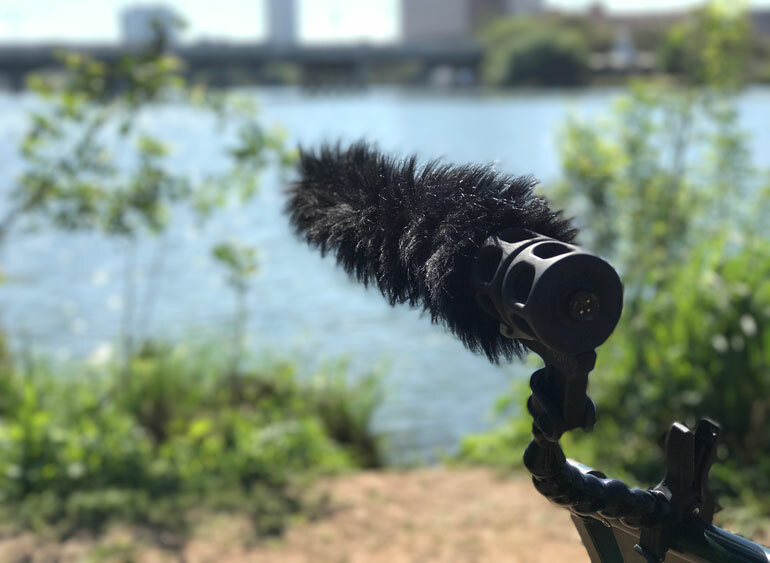 And, even in some very windy scenarios, like on the shore of Ladybird Lake in downtown Austin in the afternoon, we were able to get useable audio free of ugly wind sounds. Because we wanted our lavaliers and other mics to be protected on the leeward side of the wind, the NTG8 often ended up facing directly into the gusts… and performed just great. For our shoot with the artist Lolo, we ended up shooting in the backyard of our Airbnb. I know, I know… that actually sounds like a lame, lazy location move. But, actually it was a pretty awesome spot, with some cool cafe lighting, a grove of mesquite trees and even a vintage airstream trailer. What could go wrong, right? So, we start setting up. Things were going well, but then the cool tube amp Lolo’s guitarist had brought along died. It clicked on, the tubes lit up, but no sound. Just dead. So we were hosed. But no! This was Austin! Of course the Airbnb owner had all kinds of music gear in the neighboring party mansion. Including this sweet, vintage amp. We were saved. Sweet. Anyway, the NTG8 did a great job on the Lolo shoot, and was actually the only source to actually pick up guitarist’s back up vocals - which was a part of the composition we weren’t actually aware of before they arrived. You can check out the edited video below… and be sure to note: no visible mics in the shot. Magic! Overall, we think using a lot of different mics for the audio capture helped us give a nice, round sound in the edit. All editing credit goes to our buddy Dane Walters. The next opportunity we had to bust out the NTG8 was on a recent episode of a kid’s science series we work on called Lib Lab. For this episode, we wanted to do an open inspired by the old 1980s version of Cosmos with Carl Sagan. If you haven’t seen that series in a while, there was actually some pretty epic shots for the time, especially in the opening sequence. 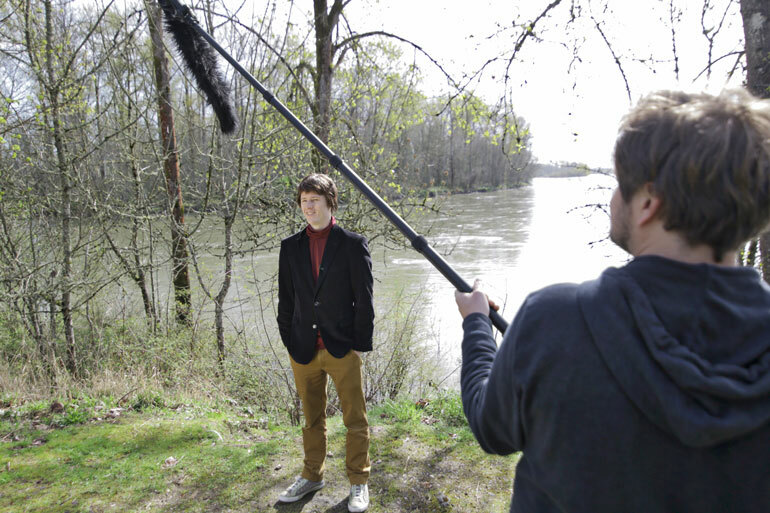 For this we needed a location to mimic a long super servo zoom in on the host, with a body of water in the background. Luckily, our little town has a river running right through it just downtown. Starting the shot with the DJI Mavic Pro, we were actually able to travel quite slowly in “tripod mode” to get fairly close to the host, though we had originally planned to transition to a C100 on a Helix Jr to extend the push in. From there, we cut to the C300 MK II on sticks to capture the voice over audio. While the location we found was near perfect visually, and there was some nice morning light coming in... it was a real challenge acoustically. There was a steady mix of local street traffic and highway overpass traffic, so our best bet was to point our mics towards the river itself, which had some sound of its own. Our Sennheiser MKE-2 mounted to his lapel definitely was picking up a lot of traffic noise, with its omnidirectional pattern. In this instance, the NTG8 proved to be a great option. We actually used the mic on our boom pole set up with the Newsshooter kit direct to the C300 with a dedicated operator (what a rare treat!). The NTG8s ability to reduce the off-axis noise worked out great. The Rode NTG8 is a pretty specific product, but it definitely has its place. If you’re looking for an extremely directional pickup pattern and the ability to reject other background noise in difficult environments, as well as a way to get your mic out of a wide shot - it’s a good option for the money. Paired with the Rode Rodelink Newsshooter Kit on a boompole, the NTG8 becomes a useful tool we now bring to many of our shoots to get better audio anytime we have an extra pair of hands to hold it.